JoAnn Getts, a parishoner at Grace Presbyterian Church, left, casts her vote for Super Bowl winner by donating cans of soup to members of the Youth Sunday School Class, Harley Allen, 17, left, Meghan Mahoney, 13, center, and Audra Widmann, 17, Sunday morning before services. The cans collected will be donated to the Food Bank of Associated Churches. Grace Presbyterian Church was ready for game day. 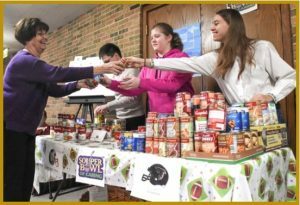 The longtime Souper Bowl Day of Caring participant had advertised to its congregation that it would again collect cans of soup on Super Bowl Sunday for Associated Churches of Fort Wayne and Allen County – an effort shared by other churches in Fort Wayne. Members of the Sunday Youth Class, which spearheaded the collection effort at Grace Presbyterian, manned a table Sunday morning, ready to accept the donations. Each can served as a vote for the New England Patriots or the Atlanta Falcons. The parishioners didn’t fumble. They brought 218 cans, 173 of which supported the Falcons, Sunday Youth Class teacher Tammy Menkes said, adding the turnout was among the best in recent years. “It’s a nice way to get the church to come together on another project that reaches out to the community,” she said. 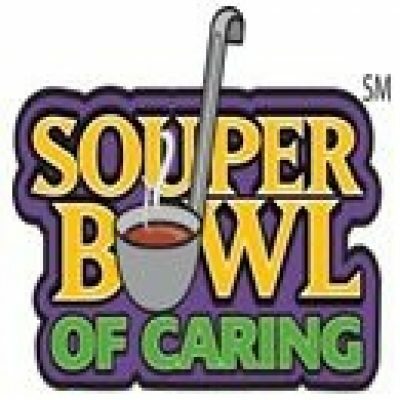 Souper Bowl Day of Caring began in 1990 with 22 churches in Columbia, South Carolina. They collected $5,700, which they donated to nonprofits. The first national effort happened three years later with participation from 36 states. More than 1.7 million food items were collected this year, according to participation totals collected from 889 groups about an hour before kickoff. Monetary donations exceeded $1.6 million. Marty Hampton, pastor at Faith Lutheran Church, said even small contributions make a difference. Her church, which had about 30 people in worship Sunday, generated $55 and about 50 pounds of food for the cause, she said. Messiah Lutheran Church collected a couple of hundred cans – a wonderful response considering the church only announced the food drive the previous week, pastor Tim Graham said. “We didn’t even print anything,” he said, adding the collection will continue another week. Similarly, the food drive will continue for two more weeks at Epiphany Lutheran Church, which collected about three cases of soup, or about 120 cans, on Sunday, pastor Richard Hartman said. He called Souper Bowl Day of Caring a tradition at Epiphany, which also collects cans of fish during Lent and winter outerwear in December and January. He said the church tries to promote the message that buying two to three cans of soup while grocery shopping might not be a financial burden for some, but it can make a huge difference for people in need. “It is a very caring group,” Hartman said.